The Benton County Solid Waste District is a governmental agency responsible for assisting citizens with proper management of solid waste including all the garbage and recoverable resources created by households, commercial sites (restaurants, offices, stores), and institutions ( schools, museums, libraries). Services include planning and implementation of recycling programs, public education regarding solid waste issues, etc. Bella Vista Recycling is a non-profit organization operated by volunteers. We gather, process and sell donated recyclable waste materials. Our aim is to keep these materials out of area landfill, to put them back into use, to save energy and to enhance our environment by keeping it clean We operate as a community service of AARP Chapter 109. 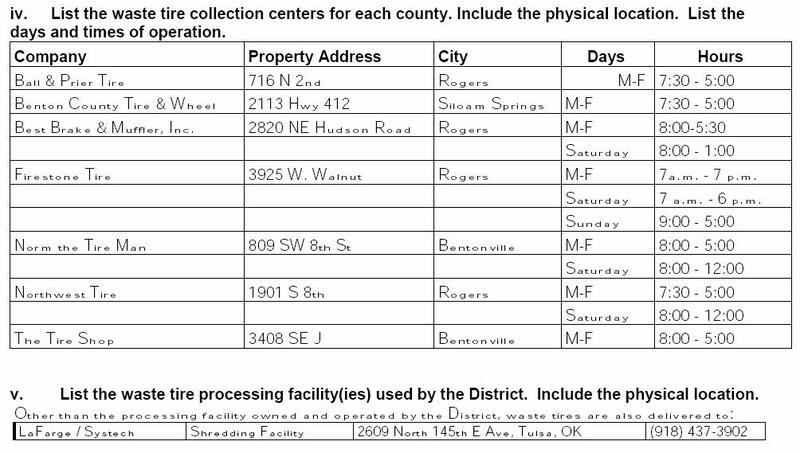 The Recycling Center is open 24/7 at the listed address. The convenient parking area for patrons coming to unload their recyclable materials is beside a long overhang providing protection in inclement weather. We recognize the positive things accomplished by area nonprofit organizations that benefit the residents of NW Arkansas with a focus on Bella Vista and the surrounding area. We provide them financial assistance with matching Grants. Inland Services provides monthly white goods and bulky waste pickup for the citizens Rogers. White goods and bulky waste is defined as common household appliances, furniture, mattresses, tools, large toys or parts thereof, Christmas trees, and all items too large to be placed in your trash container. Items excluded are hazardous waste materials (refrigerators, batteries, etc.) and construction and demolition debris. White goods and bulky waste will be collected once per month in accordance with the following schedule. If you have any questions, please call Inland Services at 878.1384. Inland Services provides weekly curbside recycling. Materials for recycling collection must be placed at the curb no later than 7:00am of your scheduled collection day. The James R. Welch Recycling Center is located at 2300 N. Arkansas Street at the intersection of Stave Mill Road. We offer drop off for the public. Our hours of operation are 8:00 AM to 5:00 PM Monday -Friday and Saturday from 10:00 to 2:00. These are the same hours that yard waste can be dropped off. If you have any questions you would like answered please call (479) 621-1185. Items we currently accept are listed below. Please clean your material before dropping them off. Please leave shredded paper in bags. Motor OilInsecticideHerbicideHazardous ChemicalsPlastic Film (sheets, tarps, or wrap)Expanded foam or clear polystyreneNOTE: Glass may be recycled at the recycling trailer located at the Compost Facility, or at one of the other drop-off recycling centers. Please return all plastic shopping bags to a grocery or department store. Each residence is provided two carts for the use of that location. You should safeguard the cart from damage and theft, as well as keep the cart clean and in good appearance. Should you need a cart repaired or to report your cart missing, please contact Allied Waste directly at 855-4226. Yard waste such as grass clippings may not be disposed of in your normal trash collection. The City maintains a composting facility at 2000 NW "A" Street for all residents to drop off yard waste. As an option, should you not have the means to take your yard waste to the composting facility, you may contract with Allied Waste directly, for a monthly fee, to have a third cart delivered specifically for yard waste. All waste collected is taken to the City's compost facility. All routes start at 6:30 AM, please ensure your cart is at the curb by that time. Remove your cart (s)) from the curb by the end of the day.